After backing away from its promise of immigration reform in 2009 and revisiting raids, the President and his lackeys have persistently pointed to early 2010 as a timetable for reforming our broken immigration system. With that timetable, comes a steep price. Can we afford the cost of immigration reform? This does not refer to monetary cost, since the Congressional Budget Office has estimated that a legalization program would bring an excess of $60-$130 billion into our coffers. Cost refers to the human cost of an enforcement and crimmigration regime, a get-tough crackdown mentality that increasingly targets people of color and their employers for alleged transgressions. The question has been flipped by some to say, “Can we afford not to reform our immigration system?” Indeed, some are willing to pay the price, no matter what it entails. That’s noble and understandable, given the desperation of a population denied the right to exist in a country they call home. 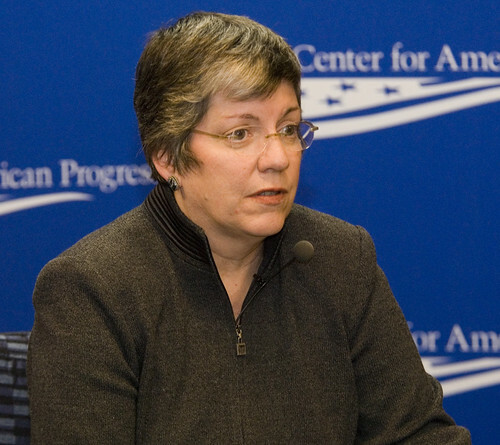 But what price does Napolitano have in store for undocumented immigrants to finally gain a pathway to citizenship? A tough and fair pathway to earned legal status will mandate that illegal immigrants meet a number of requirements—including registering, paying a fine, passing a criminal background check, fully paying all taxes and learning English. Great. What’s new about this that it needs to be reiterated a gazillion times without much action? Are we getting the chance to claim past taxes filed as social security credits too? The imposed English language hegemony is also getting quiet narrow-minded, disregarding the fact that ‘living in the shadows’ does not encourage people to fully integrate into society. The entire discourse of get-tough immigration reform seems like a way to reduce the THEM/OTHER in society rather than look inwards to our own racism and prejudice regarding the treatment of difference. Lets try to fully integrate THOSE people to live in our English-only America–a fictional America, while we do nothing to stop the root causes of why THEY uproot themselves from their homes to come here and face dehumanization, among other things. As Culture Kitchen writes, “what exactly is so dangerous about all immigrants that we need to have ‘secure communities‘ all across the United States?” Reserving the term to just the criminalization and deportation of immigrants speaks volumes for why it isn’t just about ejecting crime from society; it is also about protecting society from the ‘mass terror’ of difference. Of course, the plea to review NAFTA and global economic policies that encourage mass migration is falling on deaf ears. If you are undocumented, get ready to plead guilty to a crime, even if you have not committed one. The F4 (sibling) and F2B (adult unmarried child of legal permanent residents) categories might get scraped as family unity gets put on the back-burner. The points system is probably making a come-back. Through an expanded biometrics system, we face an increasingly securitized and ironically, fearful, America. One thing is clear, like health care, there will be competing immigration bills ranging from more liberal to really conservative ones. Take your pick and fight for the one you believe in most. What price will you pay? Next → Next post: Napolitano Says "Hands Tied?" We Don't Think So.